Meet Ghassan Widad Falih, who was born in Iraq and came to Boise in 2013, at the age of 43. Ghassan has been interested in cars since he was in the sixth grade. He worked on cars alongside his father at the family’s automotive repair shop, while also attending school, playing soccer, and swimming, and throughout college while he studied to become an aeronautical engineer. After college, Ghassan worked for the U.S. Army for three years at the Baghdad airport where he did maintenance on SUVs and other Army vehicles. His supervisor and mentor was a Lt. Colonel who played and continues to play an important role in Ghassan’s life. To escape the increasing chaos and danger in Baghdad, in 2006, Ghassan fled to Jordan with his wife and three children where they lived until 2013. In 2013, Ghassan and his family received Special Immigration Visas (SIV), which are given by the U.S. Department of State to selected individuals who worked for the U.S. Armed Forces in Iraq and Afghanistan. Pursuant to the visa’s requirements, Ghassan and his family had only 45 days to prepare for their departure to the U.S. With help from the Lt. Colonel, who knew the Treasure Valley was a safe and family-friendly community, Ghassan and his family arrived in Boise on November 6, 2013. When asked what he did upon arriving in Boise, Ghassan says, with a big smile, that he went to a hockey game with the Colonel, who has since become a good friend. They stay in regular contact, catching up over occasional dinners. Because of his engineering degree and professional work experience in Iraq, Ghassan was accepted into Global Talent Idaho’s program, where he learned how to write a U.S. style resume, and honed his interview and networking skills. To help him gain needed U.S. work experience, GTI worked closely with the Idaho Department of Labor to find Ghassan an internship as a mechanic with German Star Automotive (a Mercedes specialty shop in Meridian). 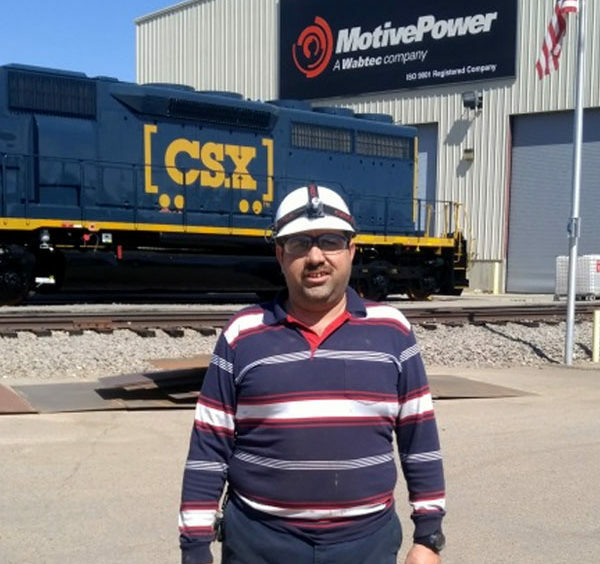 After his internship ended, and with the continued support of GTI, he was then able to use his experience to land a full-time job as a Mechanic with Motive Power, a Meridian-based business that builds locomotives. Today, Ghassan’s family is thriving. Ghassan recently found employment at Maz-Tech Automotive as a mechanic. His wife is an interpreter for Access Behavioral Health, World Relief, Agency for New Americans and the Boise School District. His kids are doing well in school, with his son is following in his father’s and grandfather’s footsteps by studying mechanical engineering at BSU. Ghassan says that his biggest challenges in the move from Baghdad to Boise were not knowing what to expect and the language barrier, which he is doing very well at overcoming. His positive attitude shines through as he talks about his journey. Ghassan’s advice for other refugees and immigrants: “Make connections with the locals and to take advantage of every opportunity – you never know where it will lead.” His story certainly proves this to be true.